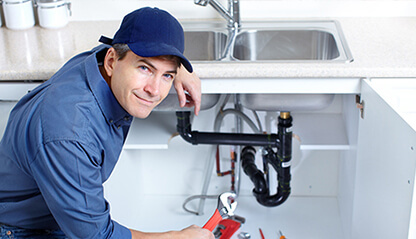 Bakersfield’s Plumbing Doc is the number one plumbing contractor in the Bakersfield, California area. We offer various services for all of your Bakersfield sewer and drain cleaning needs, no matter how major or minor they may be. We also service the outlying areas. Small pipelines such as lavatory sinks, tub drains, condensate drain lines on air conditioners, or any other small lines, we use our smallest machine called the Niard. The machine is small but powerful, and we are able to navigate it through tight turns and eliminate stubborn clogs. For larger pipelines such as kitchen sinks, we use the Junior machine to eliminate clogs. Slightly bigger than the Niard, this machine serves the same basic functions just with a larger 3⁄8″ cable for larger drains. For clogs in the mainlines 4 inches and up, we use mainline machines. We have various assortments of blades and tools that can be attached to the end of the cable to cut through roots and the toughest clogs. If there isn’t a cleanout for us to access the pipe, we can use roof vents to access the pipe and offer an immediate solution. For more serious problems such as grease and sludge, our hydro jetting services allow us to effectively remove the problems with clean, pure water. How Does Hydro Jetting Clean Residential Pipelines? Our qualified Bakersfield plumbers know that there are several ways to clean a drain line. But what if you could make it like new again? That’s where The Plumbing Doc can help. Hydro jetting uses high pressure water to break loose any sludge, grease or any other materials that slow the flow of water in your drains. It is ultimately the best form of drain cleaning. Hydro jetting can be an inexpensive solution to fix a failing septic field. A high pressure stream of water is injected into the septic line to clear obstructions like grease, hair, paper, sand, silt, and soap build up, and allow for the free flow of sewage through the system. The stream is pressurized to anywhere from 5,000 for smaller home systems to 35,000 pounds per square inch (PSI) for larger commercial systems, blasting away grime and debris. Why Call The Plumbing Doc For Hydro Jetting In Your California Home? Mini jetters are specialized for usage in small drain pipes ranging from 1 ½ inch to 2 inch lines, making it a great solution for removing clogs in sinks and showers. Hydro jetting can be deployed in pipelines with diameters up to 3 inches or larger, including mainlines. We have an assortment of tips and heads for the jetting equipment to remove sludge, roots, or any other issue in the line. When Is Pipeline Cleaning & Water Jetting Effective? Hydro jetting is appropriate for more situations than others depending on various factors. If the header line leading from the house into the outdoor septic lines is clogged, it is a perfect situation for hydro jetting to be deployed. The solid piping can reliably handle the high pressure. On the other hand, if the outdoor septic lines are clogged, hydro jetting can potentially do more harm than good, as the septic lines that create the septic field are not solid, they are perforated to allow sewage to seep out into the surrounding soil to be naturally filtered and treated. Sometimes, the high pressure from the water stream can stir up the soil and gravel near the perforations and bring more obstructions into the system. This method is often recommended to be used not just as a last effort to save a failing septic system, but as a first effort to prevent trouble. This type of maintenance will do a lot to minimize build up and blockages that can cause major problems in the future. A little work upfront can save you from a lot of headaches in the future, and septic system headaches are the worst kind! This procedure can be performed by a licensed septic installer or pumper for around one thousand dollars, though prices vary from $800 to more than $1000 depending on location and the size of the system needing cleaning. Sewer and drain cleaning with The Plumbing Doc professionals saves our customers time and money. By completing simple maintenance in your home you could save yourself a lot of time and money. You may have noticed city workers cleaning drains and checking pipes in your neighborhood. If they missed a routine check and the sewer became clogged this would cost taxpayers like you a lot of money for repairs. Your home is the same concept. You have to check you personal drains and sump pumps to be sure everything is operating the way it should. If you question your plumbing you should not postpone getting it fixed. If you are unable to unclog the drain yourself, you will find that in the long run it will be well worth the money to get a repairman to fix it. Periodically you should have your home plumbing inspected by a professional, like the city does; to be sure there is no turmoil in the months ahead. Some small things you can do to keep things flowing smoothly is get a drain catch for your sinks, tub, and laundry room floor to keep unwanted food and debris from clogging your system. These can be picked up for a couple of dollars at any store. You can also try to be aware of how much water you are using at the same time. If you need to do laundry and wash dishes after everyone in your family just took morning showers you may want to give the system a chance to clear and then do one activity at a time so you don’t overwhelm your pipes. The extra dollars would be worth every cent and you won’t regret it when your neighbor is standing in a puddle in their backyard because they missed the routine check and light maintenance required to keep everything running properly. If you are constantly fixing clogs in your sewer lines in California, it’s time to call The Plumbing Doc for a proper diagnosis. If you continue to fix the clogs, you are only fixing a symptom of a potentially much larger problem. Many times clogged drain lines and water pipe pressure problems are often a sign of a more serious problem inside the pipes. Our expert team will know the best way to tackle these problems, and when to implement hydro jetting as a solution. Hydro jetting is one of a number of methods plumbers use for piping problems. In the particular case of Hydro jetting, it is the process of using highly pressurized water to scour the inside of plumbing pipes to completely remove grime, clogs, tree roots, and much more. This process does a much better job of fully cleaning out pipes in every nook and cranny. While hydro jetting may cost more than snaking or other rooter services, it saves customers more money in the long run. Due to how hydro jetting clears entire pipes it cuts future problems as well as future service calls. The process is also very efficient and takes less time than older methods. While our technician is doing the dirty work, sanitation in your business is still important. With more traditional process there is a risk of particles and cases escaping and coming into contact with our worker, your business, or the surrounding area. Due to how fast hydro jetting is and the reach of the water, this means less time and less contact with contaminated particles. Compared to chemical and procedures involved in more traditional procedures, hydro jetting is much more friendly for the environment because it uses pure, clean water. It’s also safe for riverside or coastal businesses such as restaurants or other establishments. Call The Plumbing Doc To Lean More About The Best Hydro Jetting & Drain Cleaning Services Available in California! If you would like to know more about the benefits of hydro jetting and how it can fix the slow drains or clogged pipes in your business, call The Plumbing Doc today. We would be happy to assist you with any of your sewer line cleaning needs!